This post on clever tips to avoid colds in school kids is brought to you by Children’s Mucinex. I was not compensated, however I received complimentary product and other goodies in exchange for an honest post as part of a Smiley360 campaign. Deck the school halls with sneezing kids, fa la la la la, la la la la. Tis the season to be snotty, fa la la la la blah blah achoo. Don we now our bright red noses, FALALALAAAA…oh, you get the point. It’s cold season. Want to know how I know this? Not because I’m a former nursing student who remembers that cold season peaks around this time. Not because the internet told me so. Nope. I know this because I just got over one monster of a cold. I thought my darling boy lucked out and dodged the rhinovirus bullet, but turns out it just hit him later. Guess when it hit him? On his Thanksgiving vacation! Not fair. I think it kids are going to get hit with colds, they should at least get a real day off out of them. Of course, the best way to avoid being sick over vacation is to, well, avoid being sick in the first place. I’ve shared tips on avoiding the cold before, but this time I’m thinking outside the usual handwashing routine (although handwashing is still mentioned, hey it’s a classic for a reason!). I’ve come up with what I think are 3 clever tips for avoiding colds in school kids that maybe you haven’t already thought of. I’m not saying they’re brand new or original, nothing is original in a world with 7 billion people, but they’re new thoughts to me! Get fancy with your child’s water bottle- Jacob has snack time at school and he’s allowed to take water. Just water. Nothing else. He used to be allowed to take it in a water bottle (like the kind you recycle when you’re done), but since his class was moved, his teacher feels they crinkle too much, so now he has to have a canister. I was annoyed at first, but then I thought, this definitely cuts down on confusion over who’s water bottle belongs to whom. 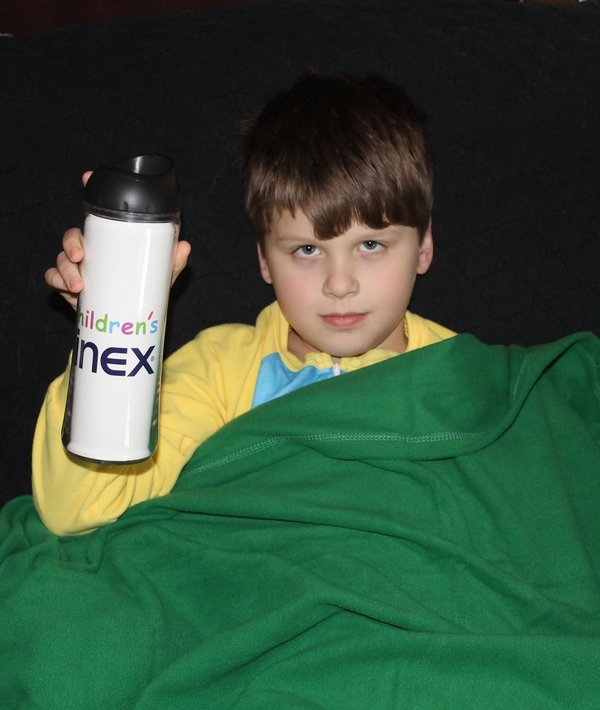 Get your child a water bottle that you can personalize, like the one Jacob has from Children’s Mucinex in the picture. Then have your child color a picture and pop it inside. Totally unique to them, so they’ll never mix up their drinks. No more accidentally sipping out of Susie’s bottle when Susie is in the incubation stages of the plague! Make handwashing fun. Wash your hands. Wash your hands. Wash your hands. If you want to avoid the cold, wash your hands. How many times do we hear it? How many times do we say it? How often do our kids actually DO it right? Let me tell you THE secret to getting your kids to wash their hands: awesome-smelling FOAMING hand soap. I buy the stuff on sale at my favorite bath and body store. Jacob goes through it like crazy because he actually LOVES washing his hands with it. You can even go all out and get a cute dispenser, but usually the foaming soap in good scents does the trick. Have a snowball fight! Don’t believe the old myth that playing in the cold gives you a cold. It’s not even remotely true. We get colds from viruses. That’s it. Viruses actually don’t live well in cold weather, so heading outdoors can actually keep colds at bay. Regular exercise also helps boost your immune system! 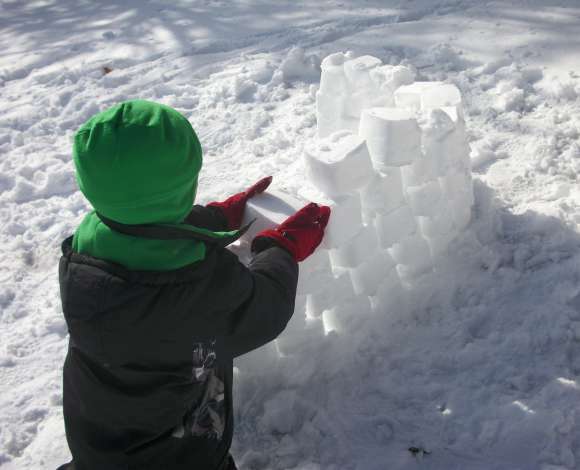 So have a snowball fight, go sledding, or build a snow fort! Alas, no matter how careful you are about following clever tips to avoid colds, kids still catch them from time to time. When that happens, Children’s Mucinex is there to help. When Jake got sick last week, I gave him one dose in the morning. He was feeling much better within an hour. I love that it doesn’t knock him out, so when he went back to school with the cold still bugging him a bit, I could give it to him before he left for the day. As far as taste goes, it’s medicine. Jake’s exact words were “it’s not bad.” To him, that’s a high compliment when it comes to medicine. No medicine is ever going to taste like candy. It shouldn’t anyway, that’s just dangerous. It works and my son takes it. He was able to enjoy his Thanksgiving break. That’s what really matters to me. Visit Children’s Mucinex to learn more and snag a $2 coupon. Like Mucinex on Facebook and follow on Twitter to keep up with news. Talk to your pediatrician before using if your child has any preexisting medical conditions or is on any other medications. I am not a doctor, nothing in this post should be construed as medical advice. I know you know that, but I like to mention it, just in case. Do you have any clever tips for avoiding colds in school kids? Tell me in the comments! I love the water bottle tip. I usually just send her with juice but water bottle from now on too. Thanks.